For Londonderry-Derry pictures of Ireland see a selection below and a short description of it. 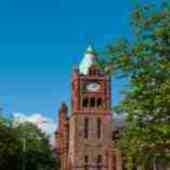 If you like what you see you can visit a fuller account of photos of northern Ireland and about Derry Ireland here which goes into a lot more detail about things to do and all the places to visit that includes Derry City, City Walls,Peace Bridge, GuildHall and some history on Derry FC, Derry GAA. So here are some Ireland photos and images of northern Ireland from County Derry-Londonderry and a short description of them. Among the many historic monuments in Derry, the massive city Walls on the west bank of the River Foyle are the most striking and memorable. 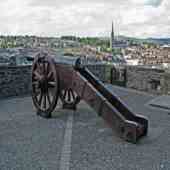 Derry is Ireland's most complete walled city. Over 1.5kms of walls encircle the centre, providing a unique walkway and affording panoramic views of the surrounding area. These impressive 17th Century stone fortifications can be accessed by clearly signposted steps, with information plaques guiding you through the city's historic heart and often turbulent past. Derry has a great riverside setting, several fascinating historical sights and a determined air of can-do optimism as part of the North’s cultural revival. In preparation for Derry-Londonderry's year in the limelight as UK City of Culture 2013, the city centre was given a makeover and an elegant new footbridge – the Peace Bridge across the River Foyle. Confirmed events include the hosting of the Turner Prize in 2013 and the world’s biggest Irish festival. 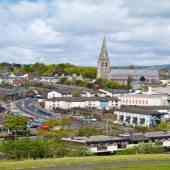 There’s lots of history to absorb here, from the Siege of Derry-Londonderry to the Battle of the Bogside – a stroll around the 17th-century city walls is a must, as is a tour of the Bogside murals – and the city’s lively pubs are home to a live music scene if you fancy a night out!! The biggest attraction is the people themselves, warm, witty and welcoming. 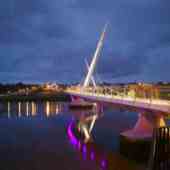 The Peace Bridge is a cycle and footbridge bridge across the River Foyle in Derry-Londonderry, Northern Ireland. It recently opened on 25 June 2011, connecting Ebrington Square with the rest of the city centre. It is the newest of three bridges in the city, the others being the Craigavon Bridge and the Foyle Bridge. The bridge is intended to improve relations between the largely unionist East Derry-Londonderry and the largely nationalist West Derry-Londonderry , South Derry-Londonderry and the City Centre by improving access between these areas, as part of wider regeneration plans. So that is three popular County Derry pictures of Ireland-now another three popular northern Ireland photos. Both the Temple and the surrounding views are among the most photographed scenes in Ireland. The Temple is also available for wedding ceremonies through arangement with the National Trust. The surrounding grounds are open from dawn to dusk all year. 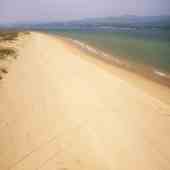 A pleasant ferry crossing of around 15 minutes connects Magilligan point and the rest of the North Coast of Northern Ireland with neighbouring County Donegal and the Inishowen penninsula, in the Republic of Ireland. The crossing provides unique views of Magilligan, Lough Foyle and the hills of Donegal and all of its beautiful Ireland landscape photos. The service provides a short-cut across Lough Foyle, cutting the driving time from Portrush to Malin Head by around 2 hours. Standing just outside the city walls the Guildhall in Derry-Londonderry, is a building in which the elected members of Derry City Council meet. It was built in 1890. It was then rebuilt after a fire in 1908. From 2000 to 2005 it was the seat of the Bloody Sunday Inquiry. The Guildhall is noted for its fine stained-glass windows. Guided tours are available in July and August. 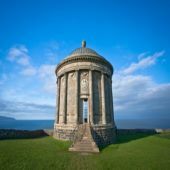 Do you have a picture that captures a special moment or a unique undiscovered place in County Derry-Londonderry?